The “Made for the Trade” exhibition explores local Native American baskets and changes that occurred through making them for sale and trade outside of the Indian community. Major weavers including Elizabeth Hickox, Nettie Ruben, Amy Smoker and Ella Johnson are emphasized, as well as collectors/interpreters including Brizard & Co., Grace Nicholson, Emma Freeman, A. W. Ericson, Alfred Kroeber and Lila O’Neale. 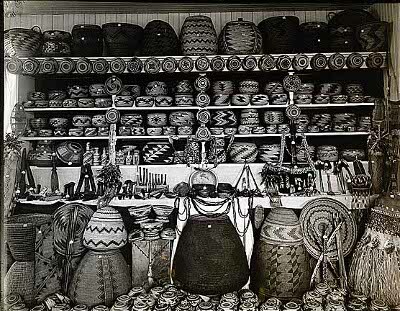 In addition, many new basket patterns appeared from weavers’ imaginations and from designs prevalent to the commercial world. on the Redwood Coast of Northern California. 400 Janis Court at Patricks Point Dr.
April 27, 2019, 2 p.m. TMS Annual Meeting. “Wildflowers of Redwood National & StateParks,” presented by Jim Webb. May 4, 2019, 10-12 a.m. Trinidad Head Lighthouse open. Ongoing, first Saturday of every month.